Desi Boho is the latest trend I am crushing on & wanted to share it with all you desi lovers too. At TSC we try to put out our favourite from the trending clothing so you aren’t confused with the abundance of options out there. This post is also an insight into the latest summer trends for your Indian clothes. Indian wear isn’t something I wear too often yet I don’t like owning stuff that’s run off the mill kinds (since I wear Indian wear seldom). BIBA is all about contemporary ethnic fashion, so it isn’t the typical stuff that you would see at a window or online. What makes the deal sweeter is that the BIBA clothing is priced very affordable. Summer Trends for the Ethnic souls? Now is when I tell you about the summer trends. Whether it’s ethnic wear or contemporary, minus a little here and there summer trends generally remain the same. Bright colours are an obvious choice for summers and a very welcome change after the darker hues of winter dressing. Floral prints are the next big hit in the summers. You can’t go wrong in the summers with floral or tropical prints. If you are comfortable with colourful dressing then there’s a bold trend to try this summer and it’s called Colour Blocking. When it comes to Indian wear though the ‘mix and match’ trend has been there for a very long time. I personally know so because I remember about 15 years seeing my mum buying different material for her kurta and different for her salwar. But then spotting the ‘Mix & Match’ collection on the BIBA site was just a reminder of how time has just made our lives more convenient. Since you have taken out time to read my post, I shall now even tell you if it’s even worth going and checking out the Mix & Match Kurta Collection? 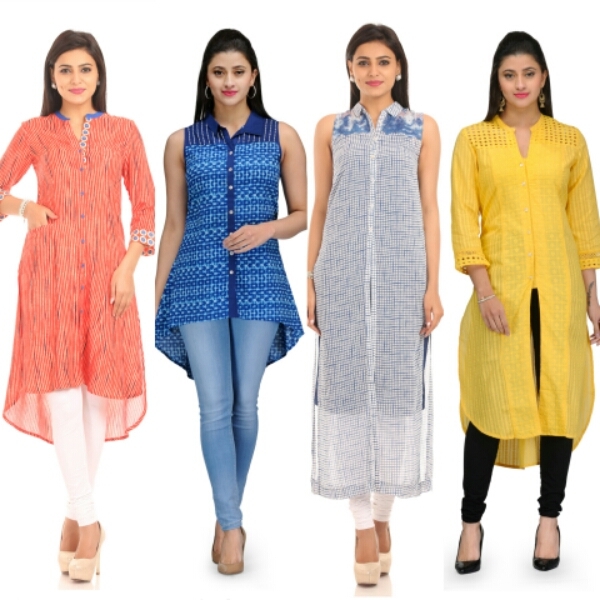 With Mix and Match you can buy your Kurtas separately & not necessarily as a set. You can make your own combination for a suit or even buy as separates. Priced very reasonably & right now especially they have a same on some of their clothing. The Mix and Match Kurtas are totally on point when it comes to ask the recent trends. Where it’s maxi kurtas to slits, high low hemlines and even shirt style kurtas. Huge variety of kurta styles, colours and prints to choose from. Sizes ranging right from 32 to 46 (S, M, L, XL, XXL) available in the Mix & Match Kurtas. Here’s a look at some of my personal favourites. TSC Styling Tip: If you ask me! The boho in me would be styling these kurtas with Ripped denims, palazzo pants or even with dhoti pants.